You’ve been hit by some sort of creative epiphany and are now carrying what we commonly refer to as an idea. Next, you’re looking for a way to translate your budding idea into a solid business case you can wrap your head around and pitch to others. Traditionally, you would go on to write a detailed 50-page business plan. Although writing a business plan can be a valuable process, there are some painful limitations to it. First, it is a very linear approach to map something that is in continuous iteration: your business. Second, it is extremely time-consuming, both to create (write) as to consume (read). Finally, it is all text, a format that doesn’t work in everyone’s favor. So what you would like is a way to build and present your business case in a faster, more flexible and visual manner? Taddaaaa! Let me introduce you to the Business Model Canvas. In this post, I’d like to propose you an alternative that is slowly but surely replacing the traditional business plan. By the end of it, you will have a good understanding of what the hell the BMC is and how you may use it to capture any business plans you might have in an intuitive, fun and agile way. 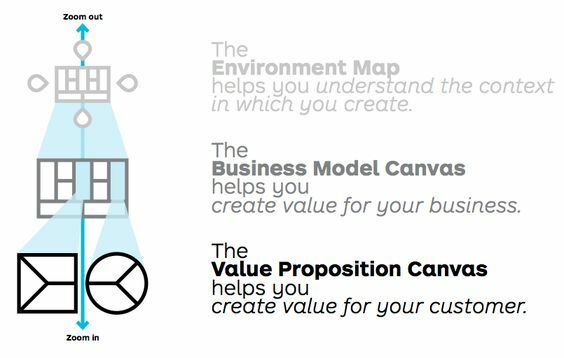 WTF is the Business Model Canvas? The BMC is a visual business tool that captures how your business creates, delivers and captures value. It presents all this in a visual template of 9 building blocks that together constitute your business. It moves from the Customer Segments, describing who you serve, to Value Proposition, outlining what you offer, to Customer Relationships and Channels, which describe how you deliver the value. Then it moves along the Revenue Streams, exploring how to capitalize on the value, to the Key Activities, Resources, Partners and Cost to line up all that needs to be in place to manifest the value chain. The BMC will empower you to design and communicate every dimension of your business plan intuitively, quickly and visually. When should I use the BMC? The BMC can be used for any business regardless of industry, offering, size or maturity. It can help you design your initial business model(s) in an ideation stage, develop them throughout the start-up stage and can as well be used to re-explore existing models in a more mature stage. The process of designing a BMC is fundamentally different than that of writing a traditional business plan. The BMC defies the limitations of a traditional business plan but in turn, has its own flaws. You don’t have the time to write a traditional business plan. You’re bored to death writing your business plan. Anyone that has written a business plan before knows that, besides the enthusiasm that is a by-product of thinking about your business, it is pretty dull and tedious work. The BMC offers a more visual, creative and hands-on process. You’re not alone in designing your business model. Besides offering a framework to any individual, the BMC is particularly helpful when there’s more than one person involved. It offers a shared language to design, discuss and pitch business models. Using the BMC as a framework to lead business discussions amongst teams will help avoid misunderstandings and therefore promote better communication and ultimately, better business decisions. You need something more flexible than a traditional business plan. A traditional business plan is a static document and therefore absurdly inflexible. If you realize halfway through your business plan that something doesn’t add up, or you have an important customer insight in the early days, you basically have to go back and start from scratch. There are not many things I hate as much as having to do the same work twice and I find it hard to imagine this wouldn’t demotivate anyone. The BMC allows you to draft, to iterate, to go back and forth, try out different scenarios, see how they integrate and play around. Pretty useful little tool, right? 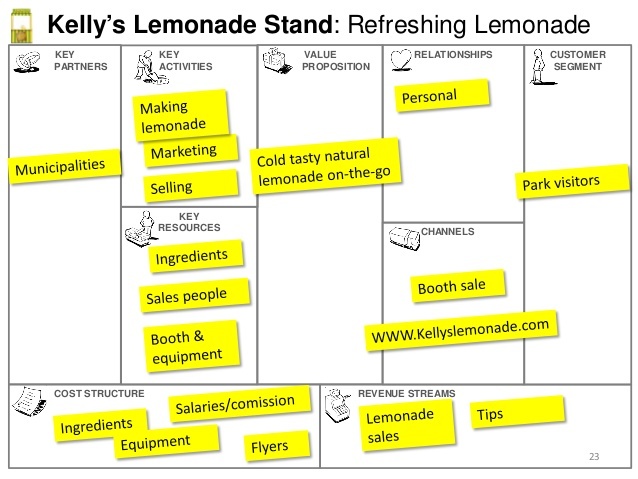 Where did the Business Model Canvas come from? Alexander Osterwalder found himself with the same issue you’re facing and set out to develop a solution. He went on to research what he coined Business Model Ontology, founded BusinessModelDesign.com in 2006, co-founded the consultancy firm Strategyzer in 2010, and then went on to co-author the book Business Model Generation in collaboration with his mentor Yves Pigneur and co-created along with 470 Business Model Canvas practitioners from 45 countries. This is the book that introduced the Business Model Canvas to the world and is described as “a handbook for visionaries, game changers, and challengers striving to defy outmoded business models and design”. It’s quite something that they’ve created. How do I use the BMC’s 9 building blocks? Now that you have a general understanding of what the BMC is, what it’s used for and how it can help you, I will briefly go through each of the building blocks of the Business Model Canvas and provide a bunch of supporting tools to help get you going. Each block includes a short description and links to tools that are developed specifically to assist you in this block’s design. If you’re looking to build something that people will love; understanding them and their needs is key. By defining your targeted market, you can start to get into your customers’ head and develop your business with the end user in mind. This will prevent you from building a product that nobody wants and more importantly; enables you to find and fulfill a true need. Value Proposition Design seeks to pinpoint the unique benefits and relevant characteristics of a product that serve a specific customer segment. It pinpoints what needs are satisfied, what problems are solved and how the product stands out from its competitors. Knowing exactly what value is delivered to your customer will help you run your business efficiently and not waste resources. Once value is created, we have to find the best way to offer and deliver it to the customer. These interactions take place with a variety of hand-picked communication, distribution and sales Channels, coloring the type of Customer Relationship. Try to illustrate all phases of the customer experience so you can optimize every step of their journey. These touchpoints in the customer’s journey hold the power to make or break the overall customer experience. Revenue streams result from value propositions successfully and profitably offered to customers. Think about how you will capture the value you’ve delivered. Now that we have a goal in mind, it’s time to make it happen. What has to be done on a regular basis in order to make this business plan a reality? Including the full cycle of value creation, delivery and capturing: these to-do’s are the Key Activities of the company. Key Resources are all the assets (physical, financial, intellectual and other) required to manifest the activities and the plans in all other elements. The Key Partners are stakeholders and suppliers of resources that are more efficiently acquired by outsourcing or collaboration. To fully optimize the business model to the environment it will operate in, we will look beyond the internal factors to evaluate external influences and the potential threats and opportunities that result from new developments. After all, businesses do not exist in isolation. That’s a quick overview of all 9 (+1) building blocks of the Business Model Canvas, along with the tools to help you along the way. I carefully selected these tools so that you don’t have to get sidetracked Googling all these new terms, and can focus on what matters – developing your ideas and channeling all your energy towards making your plans happen – instead. How should I go on to design my own BMC? If you’re ready to go, you can start designing your BMC right here and right now. You can either print a template and get to work with pens and post-its, or make a digital version with the Canvanizer tool (easy to use + free, yay!). If you’re looking for a bit more guidance before you make the leap, I think this Business Model Canvas guide by Alexander Cowan is very helpful. Or if you want to get physical, you can get a copy of the Business Model Generation book here. If you prefer video, this great one from The Startup Hustle walks you through the entire BMC + Canvanizer process, or you can watch Osterwalder himself elaborate on the BMC philosophy and building blocks. For a few more inspirations and visual innovation clues, you can also check out my Innovation board on Pinterest. And finally: keep it simple, like Emad Saif’s Lemonade Stand BMC. I hope by now you have a good understanding of what the BMC is about, and how it may serve you and those around you in crafting their business plans. Whatever you decide to do with this new info, keep in mind that business model canvassing is a tool, but most of all a verb. It is powerful because it facilitates a process of testing and iteration – the fundament of improvement. Hold on to that spirit, and I am convinced you will develop – and hopefully execute – some very interesting business models. What are your thoughts on the BMC? Did you already know about it or is it new to you? How do you use or are planning to use the BMC?